This film is, conspicuously, a remake. Not in the sense that it broadcasts its similarities and differences to the original, (in this case the 1973 version of Henri Charrière’s seminal autobiography), like some decades-later remakes do, but in the sense that it simply re-makes the first. This begs a question which Michael Noer’s new Papillon never quite answers: why was this film made? The action follows a dashing Paris criminal known as ‘Papillon’ (Charlie Hunnam), cracking safes in style in 1931, as he gets some brutal comeuppance for swindling his boss, and is framed for murder. His sentence is life in prison, specifically an overwhelmingly horrible penal colony in French Guiana. There, and over the next few decades, he attempts various escapes through a partnership with wealthy but weak Louis Dega (Rami Malek), and experiences disturbing and inhumane treatment from the prison’s guards and higher-ups. The kicker is that it’s all based on a true story, by the real Henri ‘Papillon’ Charrière, whose book of the events, published in 1969, has sold over 13 million copies worldwide. Charrière was pardoned of murder in 1970. There is a confusion to Noer’s film, however, for on its surface, it is quite compelling, but underneath, it is really just a re-done version of a film that has already been made. Steve McQueen and Dustin Hoffman embodied the roles of Papillon and Dega, respectively, in Franklin J. Schaffner’s original, which, though not considered a great film, is still a notable work in American depictions of agony in incarceration. Noer’s film has cinematic agony to spare, and at times verges into outright body horror as Papillon and others are starved, savagely beaten and whipped, and in some cases dismembered and murdered. It’s not a very fun time for anyone. Yet, despite the aspects that befuddle and disgust, Papillon delivers some affecting cinema here and there. The casting should be commended above all else; Hunnam and Malek are without a doubt two of the most capable yet underused leading men onscreen today, and it is very satisfying to watch them play off each other. 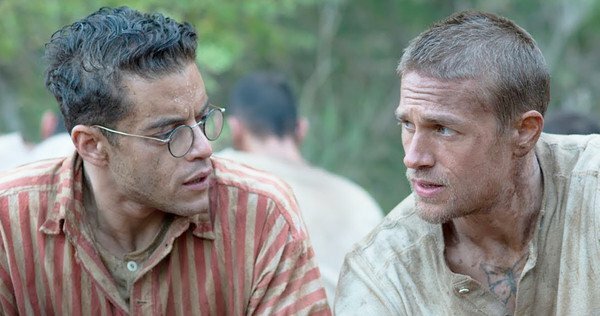 Hunnam continues to impress with his ability to flaunt his physicality and his grim charm, and for fans of his star turn in James Gray’s underrated The Lost City of Z, this film will not disappoint. Yet it is Malek who stands out the most remarkably here, and his Dega, weak-chinned but crafty, might be one of the more memorable characters of this entire festival so far. In terms of craft, Danish director Noer makes some odd choices, but none really take away too deleteriously. One qualm I had is the complete lack of establishing shots in the first half of the visuals — in a film so focused on a hellish jungle landscape, it is strange that the camera focuses more on medium shots in quite random succession. Until we get one breathtaking shot of the South American sunset on a river, followed by another strange bout of shots where a small boat at sea takes up three quarters of the frame, and an ensuing storm is relegated to a distant speck. Perhaps these are all intentional distortions of what we expect to see, but it struck me more as unsuccessful attempts to shoot around a small effects budget, which detracts from the epic nature of this decades-long story. Nevertheless, the film may be slow, but it is not boring; it is odd but not off-putting — unnecessary, but not unwelcome.